"This delicious meal comes together with just a few simple ingredients in less than 30 minutes! 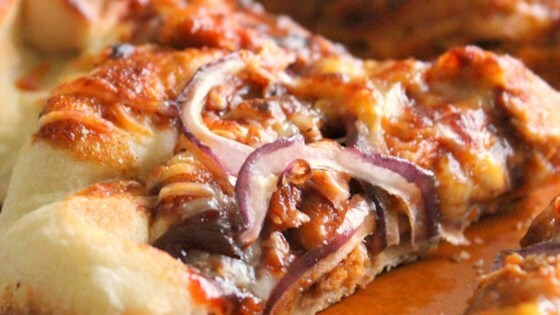 Grilled BBQ chicken, red onion, and melty cheese make for one delicious pizza. This recipe was made in a Panasonic CIO." Preheat Panasonic Countertop Induction Oven to High on the "Grill" setting. Place chicken in the grill pan. Cook chicken until an instant-read thermometer inserted into the center reads at least 165 degrees F (74 degrees C), about 10 minutes. Remove cooked chicken from grill pan and chop into small pieces. Transfer chicken to a bowl and toss with 1/2 cup barbeque sauce to coat. Open and unroll prepared pizza crust while the grill pan is still hot. Lay flat in the grill pan. Spread remaining barbeque sauce over the crust. Top with sliced onion and chicken; sprinkle Mexican cheese blend on top. Place pizza in the oven and press "Auto Cook." Select the pizza setting, 12-inch size. Allow pizza to cook until timer goes off, about 13 minutes, or until pizza reaches desired doneness. This tangy chicken dish is ready in about 30 minutes. The pizza was good we had a split decision at my house the bbq sauce was something they weren't used to tasting in a pizza but I really liked it! Made this pizza with dough from the local bakery (Great Harvest) and a pound of chicken. Hubby and I liked it and I'm looking forward to making more pizza's at home!